J Ophthalmic Inflamm Infect. 2016 Dec;6(1):26. doi: 10.1186/s12348-016-0095-y. Epub 2016 Jul 20. Bilateral acute retinal necrosis in a patient with multiple sclerosis on natalizumab. Sood AB, Kumar G, Robinson J. 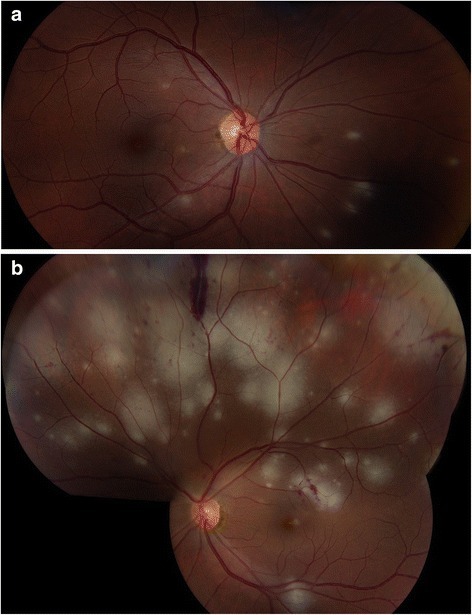 The purpose of this study is to report a case of bilateral acute retinal necrosis in a patient with multiple sclerosis treated with natalizumab. This study is a case report and literature review. A 34-year-old Caucasian female with multiple sclerosis presented with 1 week of blurry vision in both eyes during treatment with natalizumab. Clinical examination revealed bilateral acute retinal necrosis. The patient was treated with systemic intravenous acyclovir and intravitreal injections foscarnet and ganciclovir. Natalizumab therapy was also discontinued. Natalizumab is a potent immunosuppressive agent used in relapsing remitting multiple sclerosis and Crohn’s disease. The use of this medication is commonly associated with opportunistic infections in the CNS. In rare cases, ocular opportunistic infections may occur and can lead to significant visual impairment and blindness. Neurologists and ophthalmologists should be aware of this potential complication. Figure 1 a) right eye, b) left eye. Areas of retinal whitening representing necrosis, with more confluent areas in the right eye. In this new dawn of highly active therapies in MS we talk of risk mitigation, but do we really understand what we mean by this? This years ECTRIMS meeting has a whole session devoted to “Biomarkers associated with the development of PML” (Hot Topic Session 4), and will be of particular interest to patients, clinicians and pharma alike. But, in the meantime the list of possible complications of immunosuppression grows. Our trophy drug, natalizumab takes the brunt of this, following a reduction in CD4+/CD8+ in the cerebrospinal fluid versus the blood that leads to impaired immune surveillance in the brain. Natalizumab has been implicated on three other occasions with regard to the development of retinal necrosis in addition to this (Kobeleva X et al. Varicella zoster-associated retinal and central nervous system vasculitis in a patient with multiple sclerosis treated with natalizumab. J Neuroinflammation. 2014;11:19, Van Tassel SH et al. Progressive outer retinal necrosis in a multiple sclerosis patient on natalizumab. Neurology. 2015;84(21):2198–2199, Saraiva VS. Acute retinal necrosis and immune reconstitution inflammatory syndrome in a natalizumab-treated patient with multiple sclerosis. Retin Cases Brief Rep. 2015;9(3):195–197). Clearly, the reporting of individual cases in the medical literature serve the purpose of preventing clinicians from becoming complacent about the therapies we use. The retinal necrosis itself is a rare infection of the eye caused by the herpes viruses (the UK incidence is 1 case/1.6-2 million people/year). It can rapidly progress if no anti-viral treatment is given. The risk factors are recent herpes infection, genetic predisposition and immunosuppression. The causative virus can be identified by sampling the fluid in the eye. So how can we risk mitigate this one? Why not cover treatment sessions with prophylactic antibiotic cover? We already do this with alemtuzumab, so why not also with natalizumab? Clearly important to watch out for these rare but potentially sight-threatening cases. Antibiotics will do nothing for this condition as they are viral infections!